When two dissimilar metals come into direct contact and an electrolyte such as moisture is present, a battery cell is created and an electrical current flows. This causes the more electronegative or anodic metal as determined from the electro-chemical series (see below) to corrode more rapidly. 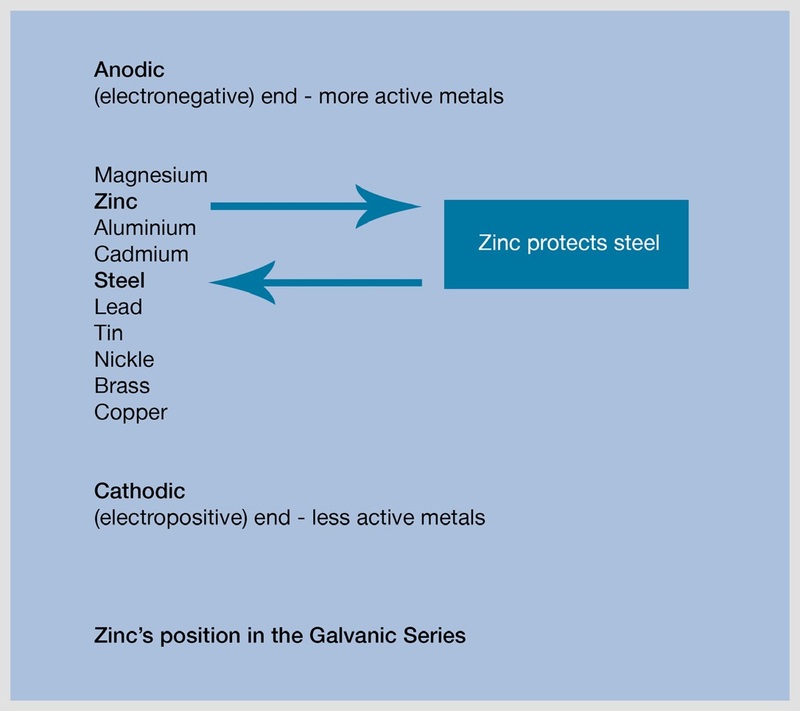 This means that galvanizing being a zinc coating will corrode preferentially to protect any metal below it in the electro-chemical series. The bimetallic effect is the basis for the sacrificial protection that galvanizing offers to small areas of exposed steel if the coating becomes damaged. The two metals in contact: When two different metals are in contact, an electrode potential is developed which is dependent upon a number of factors including the two metals and the electrolyte present. Generally, the level of bimetallic corrosion will increase the greater the electrode potential e.g. the further apart the two metals are in the electro-chemical series. However, electrode potential may vary due to oxide layer formation and can not alone be used to determine if and at what level of severity bimetallic corrosion will take place. The ratio of the surface area of the two metals: The ratio of the two metals is key and where the ratio of anodic : cathodic metals is high any bimetallic effect might be minimal. Where the ratio is reduced, problems may occur due to the greater level of oxygen reduction which might take place, leading to increased corrosion of the anodic metal. The exposure conditions: The exposure conditions are critical, as for bimetallic corrosion to take place an electrolyte must bridge across the two metal present. As a result, in dry internal environment the potential for bimetallic corrosion is very low, while in external atmospheric environments the potential increases due to the presence of water in the form of rain and condensation. The worse exposure conditions though are those of immersion in a solution where an electrolyte is permanently bridging between the two metals, the effect being greatest in an electrolyte of higher conductivity (e.g. saline water). Normally any potential for bimetallic corrosion may be alleviated by electrically isolating the two metals from one another. For bolted connections, this might be done by using neoprene or plastic washers, while for overlapping surfaces it might be achieved by using plastic spacers or painting one of the surfaces (ideally the more cathodic metal) with suitable paint system. 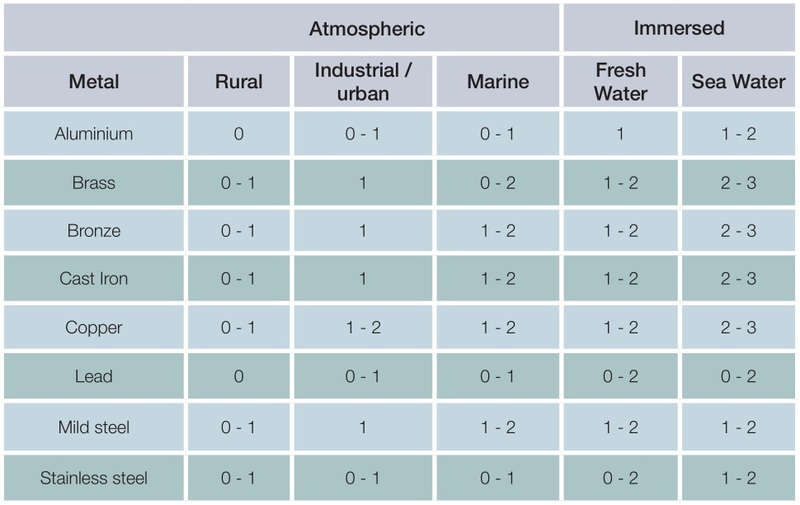 Generally, galvanized steel performs well in contact with most common engineering metals when in an atmospheric environment as illustrated in the table below, provided the ratio of galvanized steel : metal is high. Conversely, in immersed conditions the effect of bimetallic corrosion is significantly increased and some form of isolation will normally be required. Aluminium – The severity of increase in bimetallic corrosion due to atmospheric contact with aluminium is relatively low. However, it should be remembered that one application where galvanized steel and aluminium are used in conjunction with one another is aluminium cladding. In this instance, isolation is advised due to the large surface area of the aluminium panels. Copper – Due to the large potential set-up by contact between galvanized steel and copper or copper-containing alloys, ideally they should not be used together. Otherwise electrical isolation is strongly advised even in an atmospheric environment. Where possible design should also avoid run-off of water from copper onto galvanized articles as small amounts of copper dissolved in the water may be deposited leading to bimetallic corrosion. Lead – Potential for bimetallic corrosion with lead is low in an atmospheric environment and no problems have been reported concerning, for example, the use of lead flashing with zinc or zinc coated products and the use of lead in fixing galvanized posts. Stainless Steel – The most common use of stainless steel with galvanized steel is in the form of nuts and bolts in an atmospheric environment. Given the low potential for bimetallic corrosion and the small surface area of stainless steel fasteners, bimetallic corrosion would not normally be an issue, although as always best practice is to isolate using insulating washers. Practical experience suggest that where the ratio of zinc : metal is high and a rating of 0 or 0-1 is indicated, little or no additional corrosion will take place as a result of the contact. However, where the ratio of surface areas is reduced or the rating is higher, some form of isolation may be required.